On Sale Now! Save 7% on the Pyle Ergonomic Standing Desk & PC Monitor Riser - Height Adjustable Laptop & Computer Table w/ Wide Keyboard Tray - Black Sit & Stand Desktop Workstation Converter for Office or Gaming Use - PDRIS12 by Pyle at Momiji Studios. MPN: PDRIS12. Hurry! Limited time offer. Offer valid only while supplies last. The Pyle PDRIS12 Height Adjustable Laptop or Computer Standing Desk provides you maximum comfort while working for hours in front of your computer! The Pyle PDRIS12 Height Adjustable Laptop or Computer Standing Desk provides you maximum comfort while working for hours in front of your computer! It can be adjusted from sitting to standing position or vice versa so you wouldn’t have to get stuck in the same position for extended periods of time which is proven to cause health problems in the long run such as heart disease, spine problems, and even diabetes. Invest in this ergonomic desktop riser and make your working experience enjoyable and stress-free! A relaxed and comfortable worker always result to better output & increased productivity! ERGONOMIC WORKSTATION: The Pyle Adjustable Laptop Stand gives you the opportunity to work comfortably for hours! It prevents pain & further injury that you may experience in your eyes, arm, neck & back from sitting for extended periods at a time. HEIGHT ADJUSTABLE: This foldable industrial sit & stand up desk allows you to adjust its height which ranges from 5.90 to 18.90 inch tall. To adjust, simply squeeze the levers under both side or at the end of the desk & set to the desired height. SUPERIOR MATERIALS: The slim legs, frame & compact base of the desktop holder is made of heavy duty steel metal & tabletop is made from MDF board with 17mm thickness to support 2 PCs. Perfect for home, office, studio & even writing & gaming use! NO ASSEMBLY: The modern & lightweight multi monitor screen convertible riser stand comes assembled. 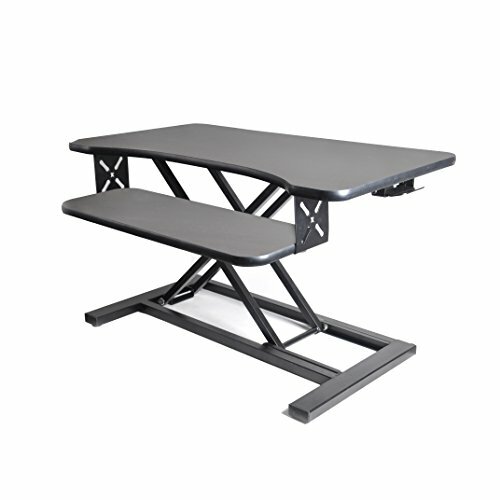 Place the elevated table on your desk, put your macbook, printer or speaker on the flat surface of the desk, set to sit or stand position & start working!